'Politicians have long appropriated the hero turned god as their totem, but never before with the ferocious intensity of the present regime,' notes Arundhuti Dasgupta. With election season upon us, Rama is back on the political front burner. 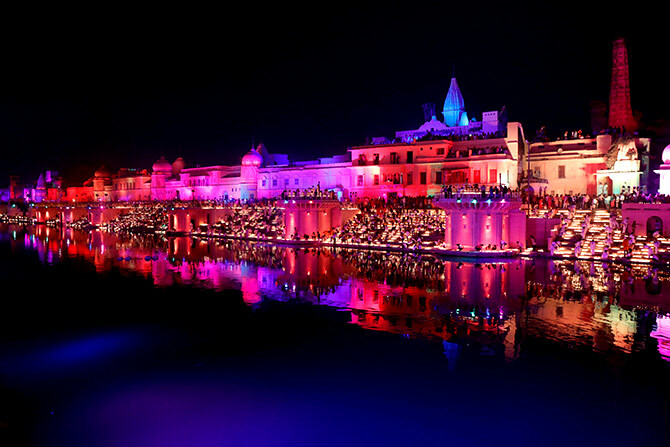 The clamour for a temple at Ayodhya has gained fresh vigour and this Diwali, the chief minister of Uttar Pradesh has even renamed a district to honour his birthplace; Faizabad is now Sri Ayodhya, the divine honorific probably meant to transform the dusty and grimy spot on the map into a place fit for the gods. Politicians have long appropriated the hero turned god as their totem, but never before with the ferocious intensity of the present regime. However, seeking political capital in Rama's name is laden with risk, not only because he is a flawed hero, but also because different communities have imagined him in different forms. And casting him in one single image could well alienate significantly large groups of people. Not everyone sees Rama as the muscular bow-wielding figure that finds favour with the present political brigade. He is a flawed husband, a negligent father, a scared warrior and even a brusque and insensitive king in many versions. In the Mizo Ramakatha, Rama and Khena (Lakshmana) carry guns and when they go to hunt a barking deer in the forest, they accidentally kill a god's daughter. In Bengal, Chandrabati's Ramayana shows him to be an uncaring husband and unfeeling father, even calling him a sinner. There are many versions where Rama beheads Shambuka, a low-caste ascetic. He does this at the behest of the then prevalent priestly order that felt threatened by Shambuka's asceticism. In some tribal versions, Sita is shown to be stronger on the battlefield. She fights a particularly violent demon king when Rama fails to face up to him. In one folk tale, he is a king who tires of his people and orders the end of the world, only to realise he has been tricked by a fish that warned a dhobi couple about doomsday and helped them to safety. The couple survive a deluge that Rama brings upon the world, but when he finds out, he is angry at the betrayal and curses the fish to lose its ability to speak. 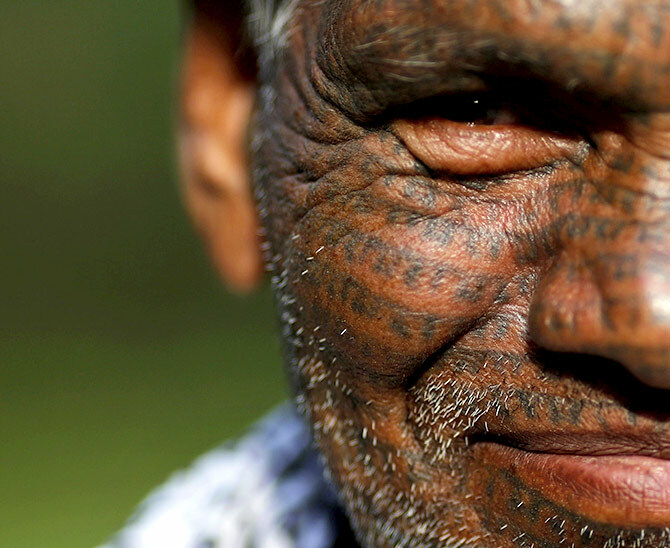 IMAGE: Tiharu Ram, a follower of the Ramnami Samaj, who has tattooed Rama's name on his face, outside his house in Chandlidi village, Chhattisgarh, November 16, 2015. 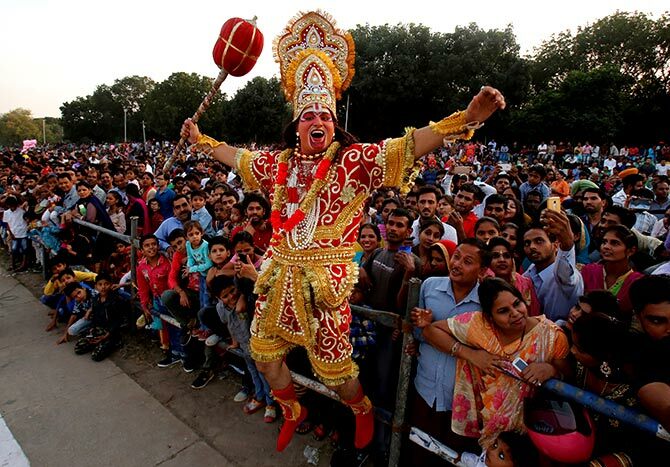 Despite the many unflattering versions, Rama's popularity has never been dented. Possibly because people were free to choose their hero to best serve their time and purpose. The Ramnamis, a low caste community from Chhattisgarh who tattoo the name of Rama on their entire bodies and chant the Ramcharitmanas, choose to recite only those verses that deal with wisdom, love and compassion. They leave the rest out of their Ramayana. To some extent, all Ramayanas play on the knowledge of previous tellings. In the Adhyatma Ramayana, when Rama is exiled, he does not want Sita to go with him into the forest. Sita argues with him, says she is his wife and should share his sufferings and so on. But when he is still unwilling, she rages back at him saying, does he know of any of the countless Ramayanas that have been composed before this where Sita doesn't go with Rama to the forest? 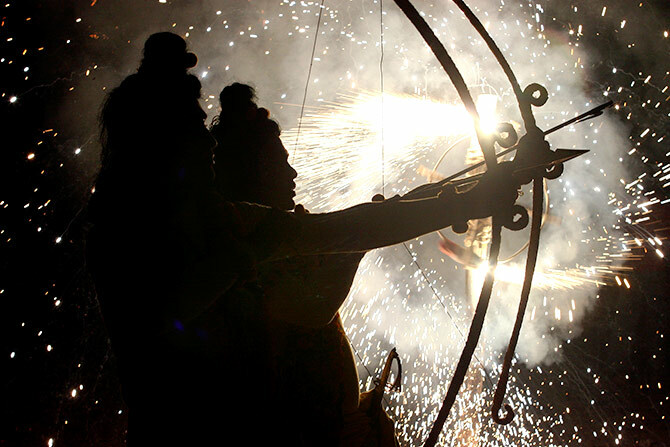 Many Ramayana texts acknowledged the existence of many Ramas with a question at the end. 'How many Ramayanas have there been?' A K Ramanujan in his essay, Three Hundred Ramayanas, addresses this question by recounting a folktale. One day, Rama 's ring slipped off his finger as he sat on his throne and burnt a hole in the ground as it fell, rolling down into the netherworld. Hanuman, who had the unique ability to shrink and expand to any size he wanted, was sent to fetch it back. But as he went down the hole, he found himself in the world of bhutas, teeming with spirits that had long left the world. Upon seeing the tiny monkey, they seized him and put him on a platter of food meant for their king. When the king asked Hanuman what brought him to the world of the dead, Hanuman replied that he only wanted Rama's ring back. The demon king then pointed to a large thali full of rings and asked Hanuman to take his pick. When an astonished Hanuman stared at him befuddled, the king said that these were the rings that belonged to the different Ramas that had come before this one and every time their time ended on earth, the rings would make their way to him. The motif that nothing in the world is unique recurs in Indian myths and has also shaped the understanding of heroism and divinity in epic and folk literature. However, as our political leaders vie for eternal glory and cast their heroes in two-dimensional moulds, our ability to live with many truths is fast disappearing.